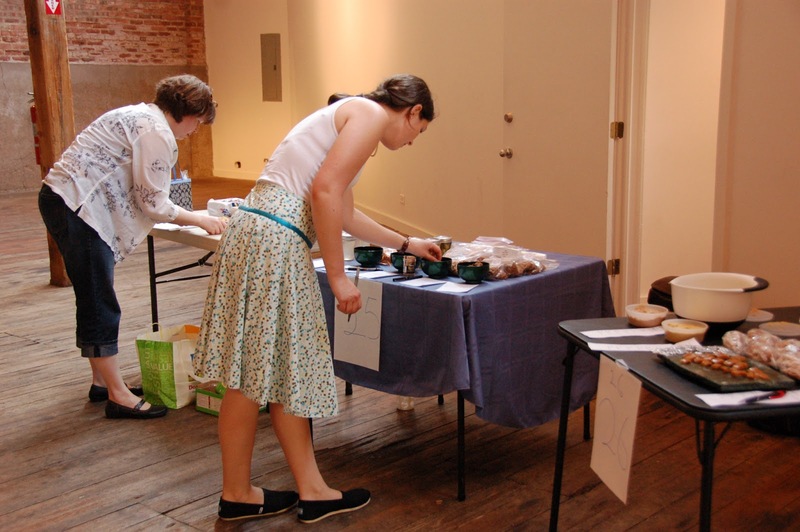 The biggest-ever Chicago Food Swap took place this past Sunday at the beautiful and spacious Gallery 1028 on Goose Island. This event was unique in a number of respects. First, we have never had a swap in such a large venue. This meant both that we were able to accommodate everyone who wanted to come and that we had room to spread out and mingle. Usually we are crammed into a tiny space which makes the swapping seem somewhat hectic and frenzied — not that that is necessarily a bad thing! The frenzy can add to the excitement. This time, by contrast, the swap had a more laid-back feel due at least in part to the fact that everyone had plenty of room to display their items and move around. The other thing that was unique about this swap was that we asked swappers to bring their own tables because Gallery 1028 is a completely raw space. I was nervous about asking our swappers to provide their own display space but no one seemed to mind and several people brought extra tables to share. The award for the most creative display space goes to swapper Jen who brought an ironing board! Speaking of Gallery 1028, what a cool event space! My mother, who was attending her first swap as my assistant, kept imagining how she would turn it into a theater. If you are looking for a venue in Chicago, definitely check out Gallery 1028. The exposed brick walls and rustic plank floors give off an industrial chic vibe. Because it is a raw loft space, you can transform it into anything you want. Mom and I looked through the album of pictures from various events held at the gallery and were amazed at how different it looked depending on the lighting and the furniture that the hosts brought in. Enormous thanks to Calihan Catering for letting the Chicago Food Swap use this unusual and striking space. For this, our biggest swap yet, we had a mixture of veteran and first-time swappers. It is gratifying to see how many people return month after month and how the returning swappers have struck up friendships with one another. At the same time, the veterans warmly welcome swap newcomers and show them the ropes. The Chicago Food Swap community is truly open and welcoming to anyone who shares our love of homemade (or homegrown) food. Everyone was especially impressed with Ally and Dave, the founders of the Ames, Iowa food swap, who came to see how our swap works. As always, the swap items were amazingly diverse. With the arrival of summer, some of the swappers had fresh items from their gardens including lettuces, kale and chard, herbs, and even some foraged wild mulberries! (I was able to swap some caramels for two bags of mulberries which I turned into a micro-batch of mulberry jam.) 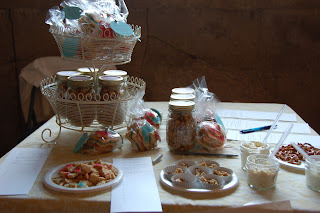 There were fewer sweet treats than usual, I thought, but the ones that were there were delicious and beautiful, such as Genevieve’s star-spangled sugar cookies, Kristl and Rachel’s cookie butter muddy buddies (yum! ), Chris’s sandcastle cakes — my kids loved these! — Jo’s Australian sponge cake, Aurelie’s real French madeleines, lemon rosemary almond brittle and chocolate-dipped dried fruit. There were impressive breads including Anna’s authentic Irish brown bread, focaccia, a rosemary garlic boule from the Iowa folks, something called “crazy” pizza bread that looked fabulous, and even homemade injera from new swapper Judy. (Injera is the spongy flat bread made from teff that you see in Ethiopian restaurants. I was so excited to score a bag of the injera because it is very labor-intensive to make and I love its slightly sour, fermented taste.) Speaking of labor-intensive, two people, Sarah and Evan brought homemade pasta. I can’t wait to try Sarah’s cracked pepper linguine with some of Morgan’s delicious spinach pesto for dinner tonight! Also on the savory side, I saw at least two kinds of homemade crackers, including “goldfish” crackers from swapper Alexis, who explained that she found the fish cookie cutter in Chinatown. Special thanks to Alexis for giving my mom some crackers while she staffed the registration table! There were many delightful concoctions in jars from Dora’s mango curd to Pauline’s BBQ sauce to broccoli stem pickles. There were also all kinds of beautiful jams and jellies. I love to see the canners come out in full force! We also had some fermentos who brought kombucha and lacto-fermented pineapple salsa. Very cool! One of these days, I am going to jump on this fermentation bandwagon and see what all the fuss is about. Swappers also brought an impressive array of dips, nut butters, pestos and hummus. If you were looking to stock your pantry, you would have found several varieties of flavored salts, spice mixes, hot sauces and extracts. One of the things I love about the food swap is that some of the treats you bring home will disappear in a day but others will last for weeks, even months. Although I was nervous about this larger-than-usual swap, everything went very smoothly. Huge thanks to my mom and swapper Dora for their help at getting everyone checked in and set up. Also, a big thanks to everyone who came for bringing tables and sharing space with others. While the food is all delicious, it is the generosity and enthusiasm of the participants in the Chicago Food Swap that makes this such a labor of love for me. 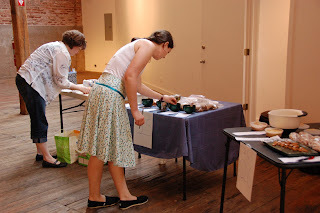 I am pleased to announce that we have the next three Chicago Food Swap events on the calendar. I am taking off the month of July so the next swap will be August 4 at Green Home Experts in Oak Park. 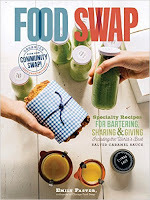 The September swap will take place on September 15 at the soon-to-be-opened Savory Spice Shop in Lincoln Square. Lastly, for the October swap on October 6, we will be returning to Peterson Garden Project‘s education space (site of the December 2012 swap) in Ravenswood Manor. Let’s hope that the weather will be nice enough to allow us to use the backyard. To find out more about the Chicago Food Swap, visit our Facebook page, follow us on Twitter or sign up for our newsletter. Hope to see you at the Swap!